Dillistone Group Plc (“Dillistone”, the “Company” or the “Group”), the AIM quoted supplier of software for the international recruitment industry through its Dillistone Systems and Voyager Software divisions, is pleased to provide a trading update for the 12 months ended 31 December 2016. The Board is pleased to confirm that pre-tax profits before acquisition related items and one off adjustments are expected to be broadly in line with market expectations, with year on year growth in revenue, EBITDA and pre-tax profits. Currency gains have impacted both our revenues and costs, however the net impact of this currency fluctuation has been positive. Both divisions will be reporting good revenue growth for the period. Economic turbulence in 2016, as noted in our Interim Report in September, has resulted in a lower than normal level of sales of new licences and subscriptions to existing clients, however licence sales to new clients and upgrades for existing clients remain strong. 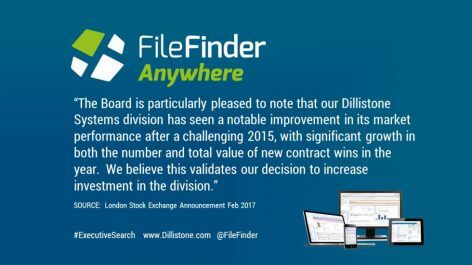 The Board is particularly pleased to note that our Dillistone Systems division has seen a notable improvement in its market performance after a challenging 2015, with significant growth in both the number and total value of new contract wins in the year. We believe this validates our decision to increase investment in the division. Product development has continued to be a priority throughout 2016 and this will continue into 2017. The Company is reviewing its amortisation policy for capitalised development costs with a view to bringing it more into line with industry practice by writing off all such costs over five years rather than a range of five to ten years. If implemented, the impact of the policy change would result in a significant one-off negative adjustment on profit before tax for 2016, a minimal benefit in 2017, but would have a positive impact in 2018 and subsequent years. This is, of course, not related to trading and will not have a cash impact on the business. The Board remains optimistic about making further progress in 2017, although it is mindful of the wider economic influences and their potential to impact on the performance of the business. The Group remains profitable and cash generative and continues to follow a progressive dividend policy, subject to the needs of the business. Dillistone expects to announce its preliminary results for the year to 31 December 2016 in the week beginning 24 April 2017.